Some Odd Girl Marker Pop Hop! Try saying that after a glass of pop or two! I'm a big fan of Kaylee and this is Gingerbread Kaylee, released next week at Some Odd Girl. Remember, Kaylee's are not just for Christmas!! ;) The papers are (Echo Park Holly Jolly Christmas) soooooooo last season Darrrrrrrrrrrrrrling, and I've used one of my favourite Die-Namics, Fishtail Flag Stax. gorgeous image and teamed with one of my favorite papers, love that, so vibrant. Hi sweetie loving this fabulous creation, the colours are gorgeous. Fabby card Faye. I love the image, the paper are brilliant and a great layout too. Super card Faye and great image. I couldn't say the title without even having the pop!!! I do get tongue tied quite a bit though! Beautiful! I love the way you colored Kaylee! Sooo sweet and Christmasie!! Hopping on! Beautiful Faye and love how you colord her!! Super cute image (that you've colored to perfection) and I love her paper pieced apron!! What an adorable card with great coloring and paper! TFS! Very festive card, love it! A very fun image. Love your card!! Awww, this is so darling!! So happy to be hopping with you! 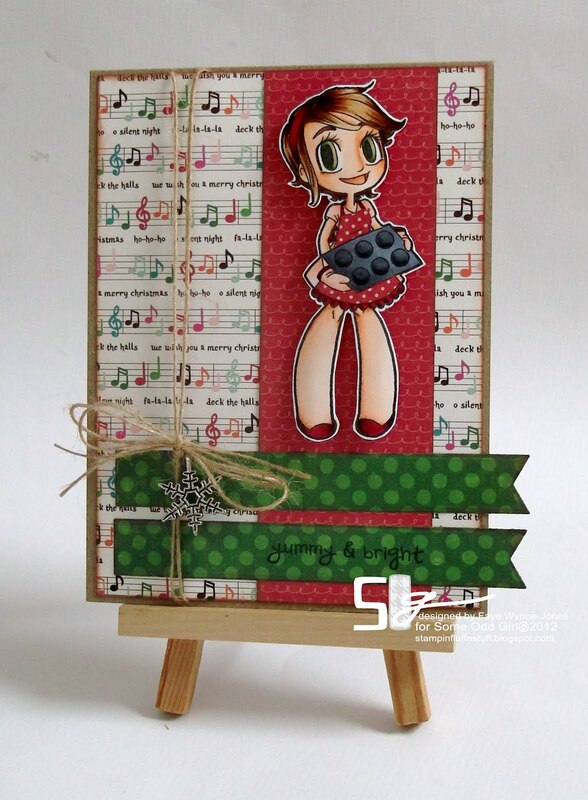 Gorgeous card.. Love her apron with the polka dots.. I like this stamp. Baking cookies is always fun. I like the apron so cute. Beautiful coloring job and what a great idea to use her for everything including Christmas! Love the paper and LOVE LOVE LOVE this stamp. Fun and cute, cute, cute! Love the pop of green on here too. Such a sweet card! And I love the paper pieced apron! wonderful! She is awesome!! Love the details on your card, especially your coloring! I love her cute little red apron with the white dots (I am a sucker for dots) love the musical paper and the cute little snowflake charm! Someone is getting a head start on Christmas baking. HeHe. Awwwww that is so darling! :) Gotta love the baked goodies! Such a cute card! Love everything about it. Delicious! I can smell those cookies :) What a gorgeous project. awesome papers, love the card! Wow! love the coloring of the image! it's just sooooo great!!!!! and the card itself is jut gorgeous! Just gorgeous Faye! Love how you used the papers! This is darling!!! Love the die-namic flag stax! love love love this..coloring is beautiful!! Fabulous coloring and great job on the card layout. 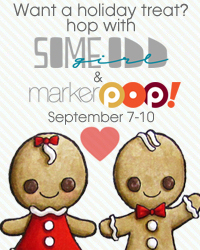 Love the papers and you are talented enough that last years papers are still fab in your hands! Great coloring and love the little streak of red in her hair, you should do that to yours! This Is Gorgeous Love These Christmas Cards .. Makes Me In the Mood To Decorate And Halloween Aint Got Here Yet Lol.. Beautiful Card ..
Oooo, stunning colouring Faye, I'm so in envy of your skills! cute card...really like the colorful music note paper. Love this hop :). Every one makes a differend card and have differend colours on there cards. I realy love it, i get some inspiration from it all!! She is seriously cute! Great card! Love your card! Very festive! Hi Faye, had to stop by to admire this a little more! You guys over in the U.S have the bestest papers ! Thanks for sharing such a stunning card ! A really cute Christmas card. Thank you for the inspiration. Very cute card love it!